Ruling Awami League Joint General Secretary Mahbub-ul Alam Hanif on Thursday said the Election Commission is more sympathetic towards BNP, while harsh towards AL ahead of the December 30 municipal polls. “As the EC is more sympathetic to them (BNP), but a little bit harsh for us, which created some problems for us in the field. We’ve raised the problems,” he told reporters after a meeting with Chief Election Commissioner Kazi Rakibuddin Ahmad at the EC Secretariat. An AL five-member delegation led by Hanif sat at the meeting with the CEC to raise some complaints that the ruling party candidates are being subjected to harassment by the returning officers and the administration in different places, UNB reports. “Activists of our candidates were fined without having logical ground in many areas,” the AL spokesman said. 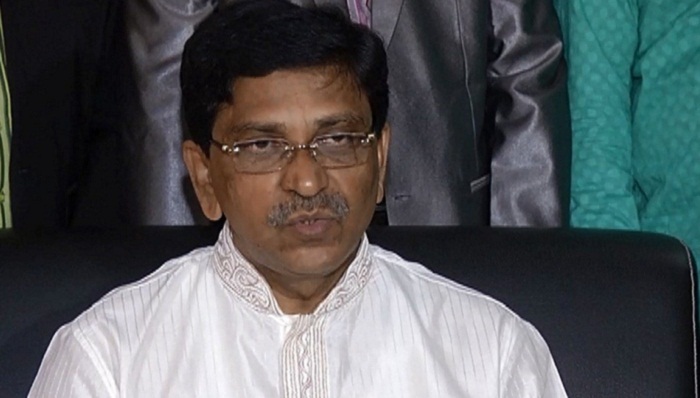 Saying that BNP is getting extra advantages and its top leaders are now participating in electioneering, Hanif said “As BNP is not in Parliament, they get additional advantage…. but we, members of parliament, were deprived of the advantage,” Hanif said. He alleged that BNP wants to get sympathy from the Commission by providing it with largely untrue and fabricated information. Noting that BNP is now hatching conspiracies, the AL leader said two AL activists were killed in Jamalpur and attacks were carried out in many places. He said BNP want to get extra advantage in the election shifting blame of their internal feuds on AL. “This is why we requested the Election Commission not to behave harsh with us becoming more sympathised to BNP,” he added. “In fact, BNP now enjoys not only level-playing field rather level-playing field-plus in the election,” he said. Replying to a question over violation of election codes by MPs, he said the EC is quite independent. If any MP violates the election code of conduct, it can definitely take action following investigation, he said. “We’ve asked them (EC) to make the election free and fair exerting their maximum power. Being a ruling party AL will always cooperate with them,” he added. In reply to another question about the law and order situation, Hanif said the current law and order situation is satisfactory and election-friendly. The BNP leaders delivered remark distorting the history of Independence of Bangladesh, its Liberation War and freedom fighters, he alleged. About AL’s objection to 10 election monitoring organisations, Hanif said all the organisations have affiliation to a particular political party and they would implement the agenda of the party.